Dancer Darlene Walker moves from the hand of Woody Woodruff to Gary Carlson. Duane Carter spins Julieanne Ferguson showing the many layers of her purple square-dancing skirt. 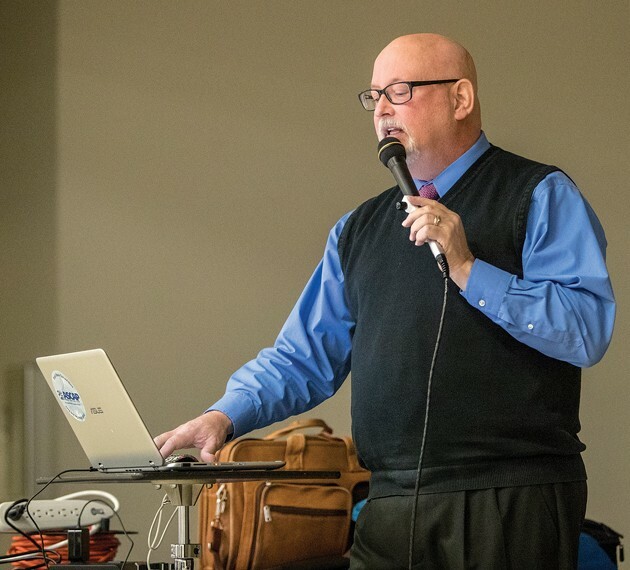 Ross Lopton serves as the caller at a TC Squares dance in January. Lopton has been calling for over 12 years. Lopton doesn’t just call, he also dances. Conrad Lloyd and Allette Zhunzeker give each other kudos after pairing up to dance. Dancers of all ages are welcomed in the group. Lizzy Ashbury and Lloyd at a Monday evening dance in January. Lloyd knows a lot about the history of square dancing. Gary Carlson and Virginia Bowen listen to caller to make their way around the dance floor. Larry Bowen joins hands with other dancers and moves to the center of the square. Woody and Roberta Woodruff are two hip squares. 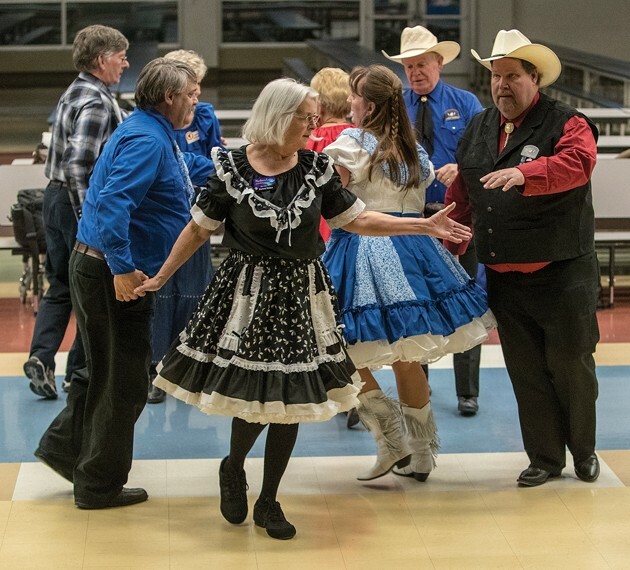 In fact, they are square dancers — actually fanatics — who mentor Tooele County residents to perform highly aerobic paired moves to lively music. If the residents they teach weren’t family before — after several lessons over a few weeks’ time — the Woodruffs make them their square dancing family. “Years ago, Tooele had a big square dancing group. It fizzled out and we’re hoping to get more dancers back,” Woody said. Right now, the group has about 12 regulars. 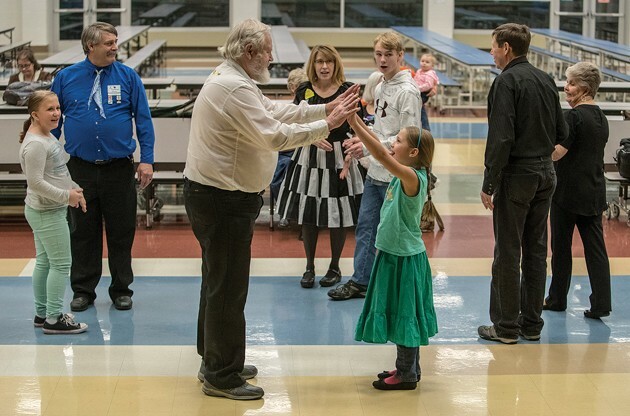 In 2015, the Woodruffs, who are Grantsville residents, organized the non-profit club TC Square Dancers after the two reunited and based their second marriage, this time to each other, on a shared lifetime love for square dancing. Every Monday night, they are imparting their passion for this old folk art to a new generation at Clarke Johnsen Junior High, where Woody works during the daytime as a custodian. 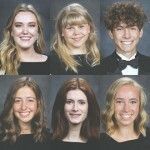 There they teach dancers, four couples facing each other in a square, to do-si-do, swing partners and allemande left to upbeat tunes that will make even casual observers tap their toes. The Woodruff’s story covers nearly a quarter of a century. They met in 1989, when both were 31, while playing volleyball at a Taylorsville City park. That day, Roberta invited Woody to go square dancing. Woody’s only square dancing experience to that point was in the fifth grade. The following year, the National Square Dancing Convention came to Salt Lake City and the two decided to partner up for the three-day event. The two said they had a blast at the convention and Woody even helped as an event host. He served on the hospitality committee, where he greeted dancers at the airport, called hotels to pick up dancers, provided guests with maps of Salt Lake City and helped dancers register for the conference. Both Woodruffs recall this experience as one of their happiest memories. However, at that time, Roberta was in a relationship with someone else. As a result, after the convention, they went their separate ways. Time passed and circumstances changed. Five years ago Roberta, then divorced, decided to look up her favorite square dancing partner on Facebook. Unbeknownst to Roberta, Woody was also going through a divorce. When Roberta saw Woody’s profile picture, she didn’t know if this was the Woody she knew. He was wearing an umpire’s mask. She swallowed her pride, took the risk and decided to message him. Woody responded to the message and on Valentine’s Day 2014, the couple were married on the Ferris wheel at the Scheels store in Sandy. They were one of 16 couples Salt Lake City radio station K-Bull married that day. Soon after the wedding, Woody and Roberta built a home in Grantsville. Next, the two decided it wasn’t enough to be back together; they needed to get back into square dancing. In 2015, the Woodruffs hatched the idea to start a local square dancing group. They formed TC Squares, and welcomed dancers young and old, beginners to advanced, who wanted to learn or who needed a venue to dance. “I’m not close to my family, physically or otherwise, so the square dancing community is my family,” Roberta said. Which has its benefits. 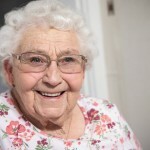 Roberta recalled one embarrassing memory that happened 10 years ago, when the back zipper on an older dress she was wearing broke during a dance. Roberta is a little more particular about her own square dancing costume. She sews her outfits, but she suggests that those who don’t sew can look online. She also said she would be happy to sew an outfit for someone after they pick out fabric. Woody’s outfit is simple. But when he’s not square dancing, he also enjoys wearing another outfit — an umpire outfit. As the head custodian at the junior high, during off hours, he rubs shoulders with many of the school’s students when he referees their games. 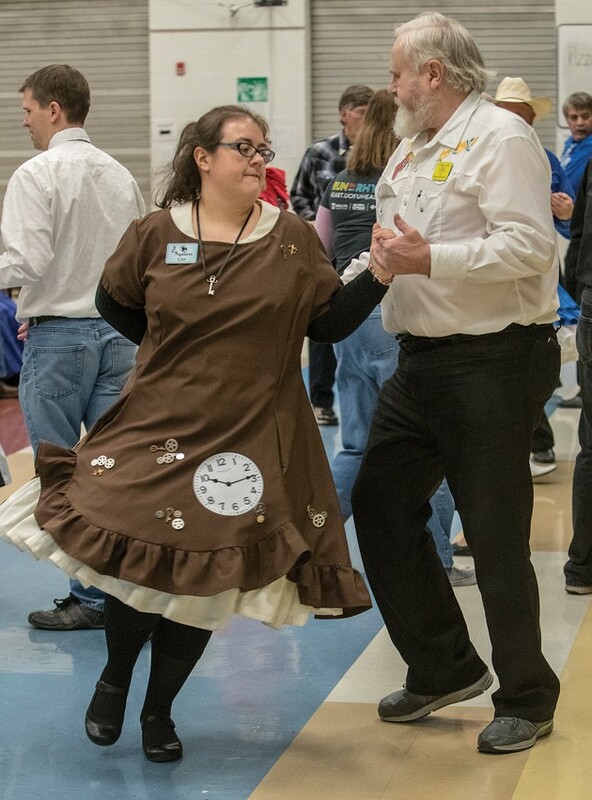 In addition to attire, music is another aspect of square dancing that is unique to the art form. “It’s nice to have a song with a good strong beat because it’s easier to dance to,” Woody said. Not all of the music played is country. In fact, the caller picks the music. 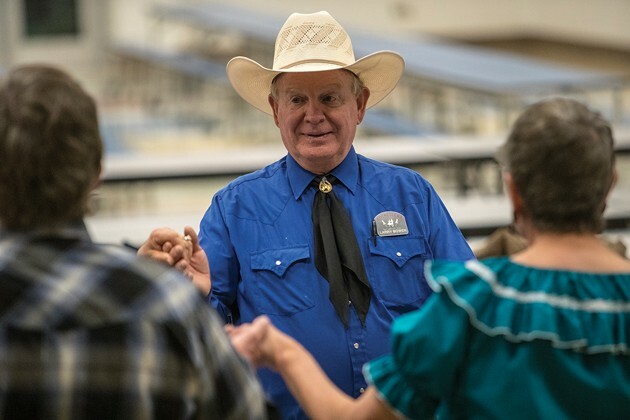 The Woodruffs hired their friend, Ross Lopton from Salt Lake, to be the club caller — the person who prompts the dancers to execute the square dance moves. “You couldn’t ask for better friends,” Lopton said of the Woodruffs. Lopton, 58, now has over 12 years of calling experience, but he started the hobby to overcome his fears. One of Lopton’s friends challenged him to try calling and he has been calling and dancing ever since that day. 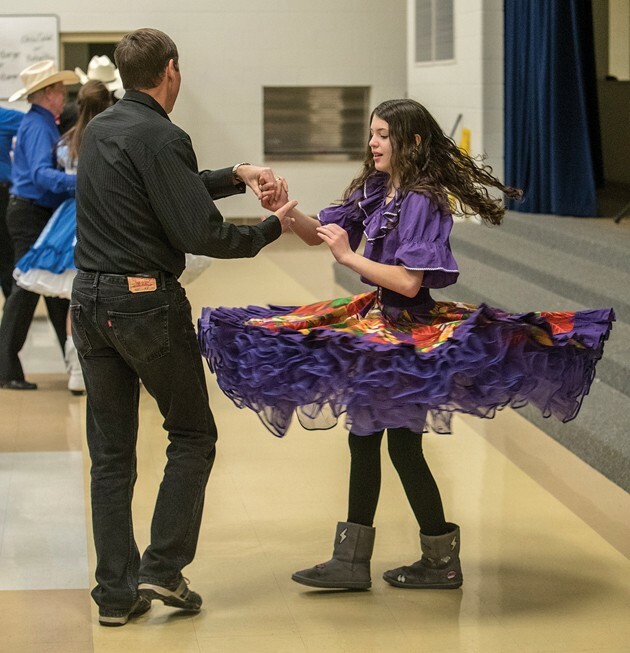 Lopton encourages families to come try square dancing together. He believes it is for all ages and he particularly enjoys watching kids figure out the different dance moves. “The way I describe something to them, they may see it differently than what I see,” Lopton said. Roberta said callers train at a special school. Next they pay a licensing fee, and then apprentice under a seasoned professional. Woody recently experienced his first calling gig at Clarke Johnsen after assembling some of the tools of the trade. 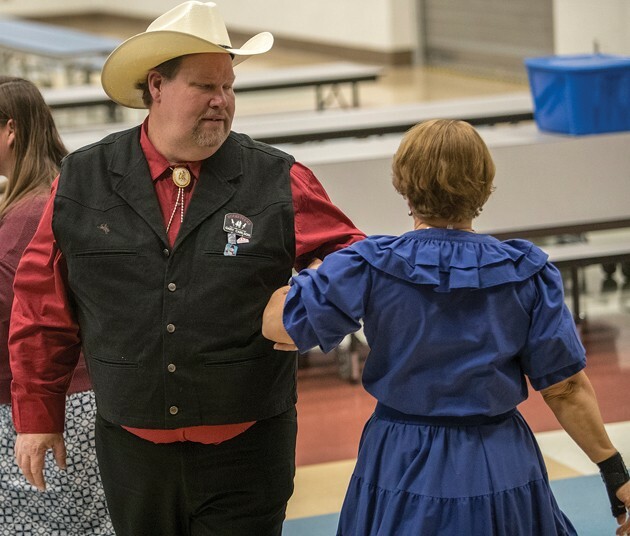 The dance was to reward student achievement, but Woody also organized the teachers to perform a square dance exhibition. “I love the kids. 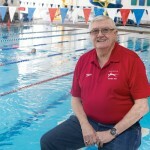 The hardest part about calling for the kids was to be the teacher and not the custodian,” Woody said. One of the Woodruffs favorite dance experiences happened at the 2014 Stadium of Fire performance. The event’s organizers asked Roberta to choreograph a square dance program for 32 dancers. Roberta remembers the experience fondly now by wearing a grasshopper dangle, a charm that hangs from the name badge she wears. 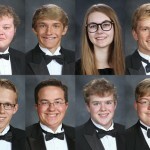 Last year, TC Squares graduated 12 students from its program. The students begin their study of square dancing in September and they graduate in May having learned 64 square dance moves. In May of last year, TC Squares also traveled as a group to the state square dancing festival, wearing their traditional TC blue colors. TC Squares is one of 30 clubs in Utah. The groups often travel to dance with other clubs in the state. In fact, the groups have organized a friendly game of stealing the other clubs’ flags. Each club has its own flag-like banner, the Woodruffs explained. In order to get a group’s flag back, the club must send eight dancers — a full square — to the anniversary dance of the other club. Woody recalled when one club forgot to bring its flag to its anniversary dance. But one of the women took off her shirt and gave it up as the flag. Fortunately, he said, she had something on underneath, but the gesture gave everyone a good laugh. “It shocked me,” Woody said. Not only have the Woodruffs put a lot of effort into their chosen sport, they say they have received a lot in return. 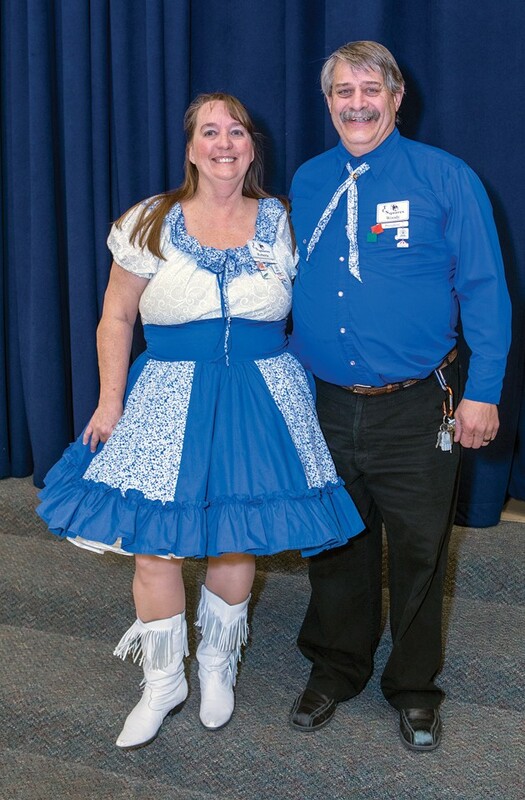 Woody and Roberta found each other through square dancing and they have built, from the ground up, their own square dancing family. Everyone is invited to join TC Squares on Mondays from 7:30-9:30 p.m. at Clarke Johnsen Junior High School. Anyone under 12 needs parental supervision. The cost is $2 for 8-14 year olds, $3 for 15-17 year olds, $5 for 18 and above, and $10 for families, which pays for the caller and use of the building. For more information, contact Roberta Woodruff at 801-349-5992 or check out the website at tcsquares.com.